According to the Edmonton Journal Strongco Corporation (TSX: SQP) today reported financial results for the first quarter ended March 31, 2016. * Comparisons are between first quarter 2016 and first quarter 2015. † “EBITDA” refers to earnings before interest, income taxes, amortization of capital assets, amortization of equipment inventory on rent, and amortization of rental fleet. EBITDA is presented as a measure used by many investors to compare issuers on the basis of ability to generate cash flow from operations. EBITDA is not a measure of financial performance or earnings recognized under International Financial Reporting Standards (“IFRS”) and therefore has no standardized meaning prescribed by IFRS and may not be comparable to similar terms and measures presented by other similar issuers. The Company’s management believes that EBITDA is an important supplemental measure in evaluating the Company’s performance and in determining whether to invest in Shares. Readers of this information are cautioned that EBITDA should not be construed as an alternative to net income or loss determined in accordance with IFRS as an indicator of the Company’s performance or to cash flows from operating, investing and financing activities as a measure of the Company’s liquidity and cash flows. Strongco’s revenues decreased by 3% year over year to $109.7 million in the first quarter of 2016. The decline was mainly in Alberta where revenues were down $11.5 million, or 38%, due to weak market conditions in the region as a result of the decline in oil prices. Overall equipment sales were up 3% year-over-year, as strong crane sales in Eastern Canada more than offset the decline in equipment sales in Alberta, while rental revenues and product support sales were both lower in the quarter. Despite the lower revenues, gross profits were virtually unchanged from a year ago at $21.1 million. As a percent of revenue, gross margin was 19.2%, up from 18.8% in the first quarter of 2015 from stronger margins on equipment sales, rentals and parts and service. During the first quarter, Strongco recorded a restructuring provision of $1.7 million for severance and termination costs of senior executives and other employees, in response to ongoing weak economic conditions. Before the restructuring provision, operating expenses were $19.7 million, compared to $19.0 million in the first quarter of 2015. The increase related primarily to depreciation of the new SAP computer system, which went live in 2015, and the impact of the weaker Canadian dollar on translation of the expenses of the Company’s U.S. operations. While the Canadian dollar remained weaker compared to the first quarter of 2015, it strengthened slightly in the quarter from where it stood at December 31, 2015. This currency movement resulted in foreign exchange gains on US Dollar liabilities of approximately $0.9 million in the quarter. As a result, operating income, before restructuring costs, was $2.5 million, compared to $2.1 million in the first quarter of 2015. Interest expenses were down in the quarter by $1.3 million from last year to $1.8 million as a result of reduced equipment inventory and the associated debt. This resulted in pre-tax earnings of $0.8 million, before restructuring costs, which compared to a pre-tax loss of $1.0 million in the first quarter of 2015. After tax and restructuring costs, there was a net loss of $0.7 million, compared to a net loss of $0.8 million in the first quarter of 2015. 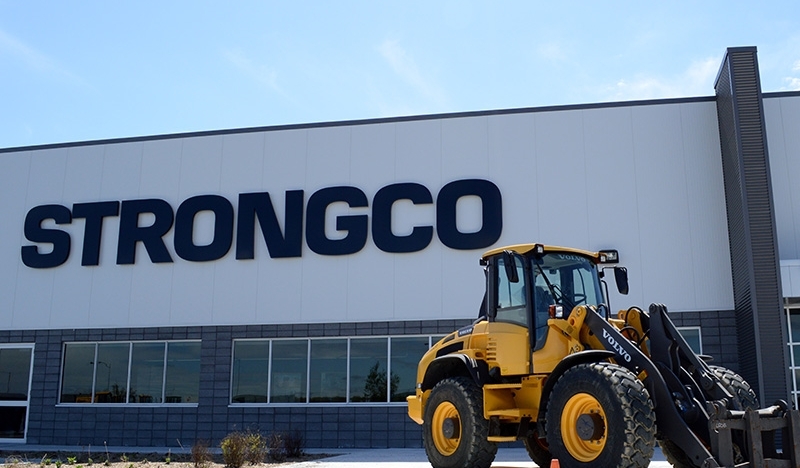 Strongco has achieved a significant reduction in equipment inventories and the associated equipment finance debt. At March 31, 2016 equipment inventory was $176.7 million, down $22.3 million from December 31, 2015, and $30.8 million from the same time last year. At the same time equipment notes payable were reduced to $154.0 million from $180.3 million at the end of 2015, and $183.2 million a year ago. After the mild winter, with the early start to spring, Management anticipates increased construction activity, which will lead to increased demand for equipment, parts and service. However, market conditions are expected to remain challenging throughout the balance of 2016 in Canada, particularly in Alberta and Quebec, while, in New England, ongoing recovery in traditional markets for residential construction and forestry should continue to benefit heavy equipment markets. In Alberta, with no recovery in the price of oil anticipated in the near term, economic activity across the entire province is expected to remain depressed. New development in the oil sands region of northern Alberta has been severely curtailed, which has led to significant cutbacks and layoffs by the oil companies and related service companies. Demand for heavy equipment and cranes is expected to remain weak throughout 2016. In response to the current market conditions and weak outlook, management has made adjustments to the cost structure, with layoffs and other cost reductions, and is focusing on continuously improving operating efficiency and our level of sales execution. The recent fires in and around Fort McMurray have exacerbated the already weak market conditions in northern Alberta. While management is hopeful these fires will soon be brought under control, it is too early to determine the extent of damage and impact on heavy equipment markets in the region and the province as a whole. In Ontario, while construction activity remains somewhat buoyant, most activity is of a smaller scale and there remains an overall air of caution, which is affecting the purchase decisions for heavy equipment. The current low oil prices and weak Canadian dollar should be of benefit toOntario’s manufacturing sector which could lead to improved confidence and new investment and increased demand for heavy equipment. However, no significant government infrastructure spending has been announced and few large projects are underway or planned for the near term. As a result, larger scale construction activity is expected to remain low and demand for heavy equipment, especially general purpose equipment, is not expected to increase significantly in 2016. In Quebec, overall, demand for heavy equipment and cranes is expected to remain soft in the near term. While the report on the investigation into corruption in the construction industry by the Charbonneau Commission was issued late in 2015, there has been little improvement in construction activity in the province and with no plans for significant new government infrastructure spending, construction activity in Quebec is expected to remain weak in the near term. There have been positive signs with increased activity on the reconstruction of the Turcot Interchange in Montreal and the new Champlain Bridge, which began in the summer of 2015, but beyond these two large projects, activity is expected to remain slow. As the majority of heavy equipment is priced in US Dollars, the weak Canadian dollar has resulted in the cost of new equipment to Canadian dealers rising. In the current weak construction markets, it has become more difficult for dealers to pass on these higher costs, which has resulted in lower sales and margins. The Canadian dollar is expected to remain weak in the near term in response to continuing low oil prices, which will continue to impact sales and margins. With this economic backdrop, the overall markets for heavy equipment across Canada are expected to be flat to down while competition is expected to remain strong. In response to the weak market conditions in Canada, particularly in Alberta, actions were taken to contain and reduce costs in 2015 and additional measures are being taken in 2016 to further reduce costs without impacting the Company`s ability to service its customers. In addition, with the expectation of continuing weak markets, management is taking further aggressive action to reduce aged equipment inventory and the associated financing to lessen balance sheet leverage and free up cash. Heavy equipment markets in New England are expected to show further modest improvement in 2016 as the U.S. economy continues to grow. The traditional markets for residential construction and forestry, which experienced an uptick in 2015, are expected to remain active in 2016 which will result in continued demand for heavy equipment. Strongco will hold a conference call on Thursday, May 12, 2016 at 10:00am ET to discuss first quarter results. Analysts and investors can participate by dialing 1-800-319-4610 or +1-604-638-5340 outside of Canada and the USA. Following management’s introductory remarks, a question and answer session will take place for analysts and institutional investors.